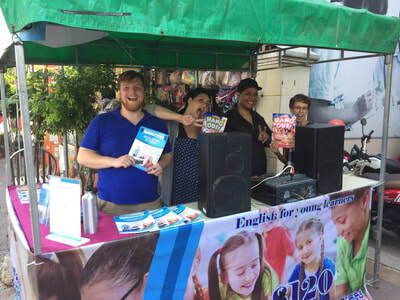 Neither Billy nor I have ever taught English as a Foreign Language before, so this was a new experience for us! 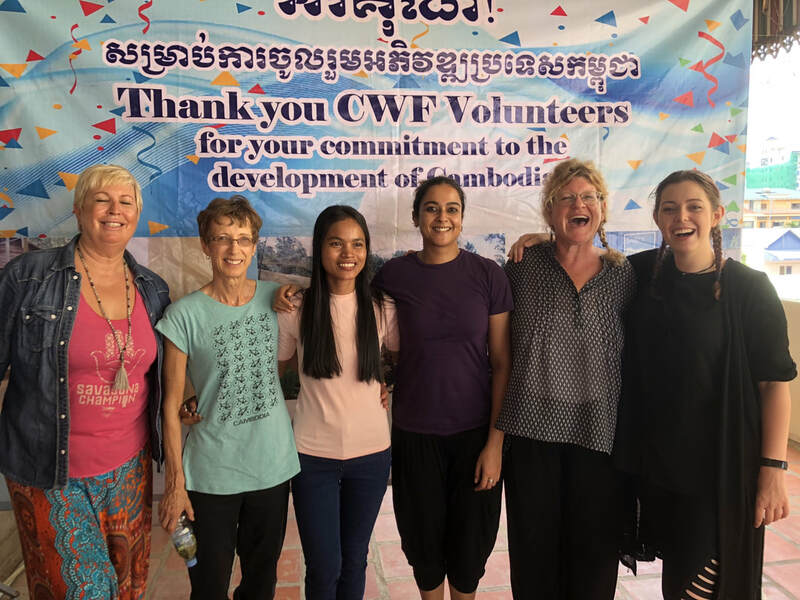 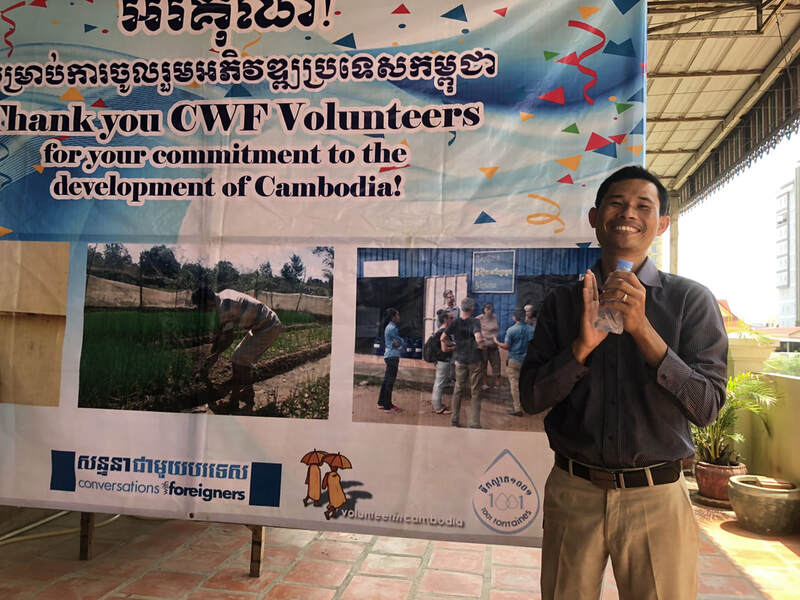 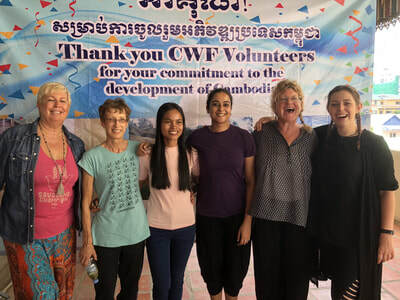 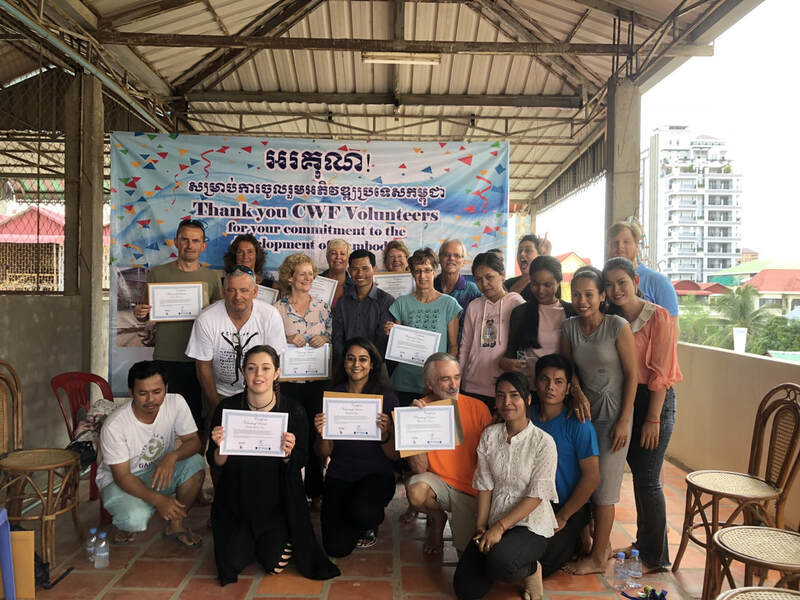 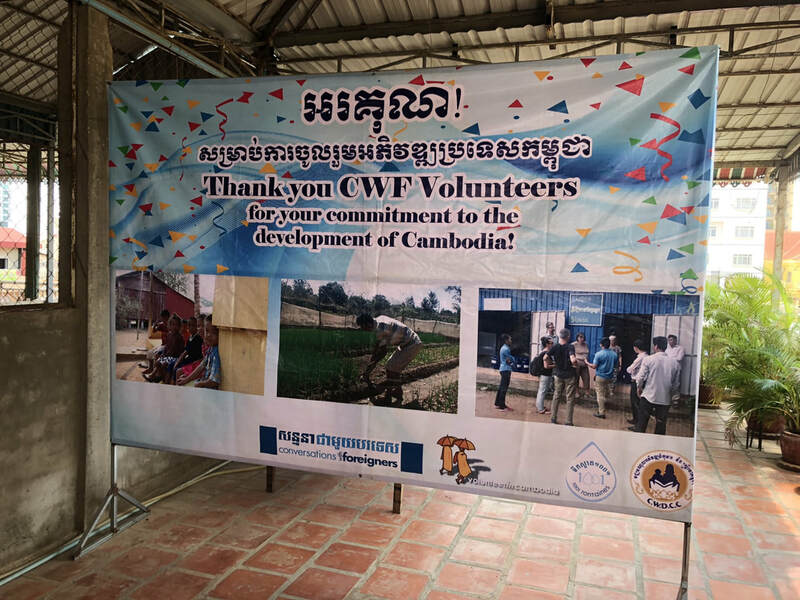 The organization, 'Conversations with Foreigners' (CWF) runs on a 4 term year, so each 3 months another group of volunteers comes in. 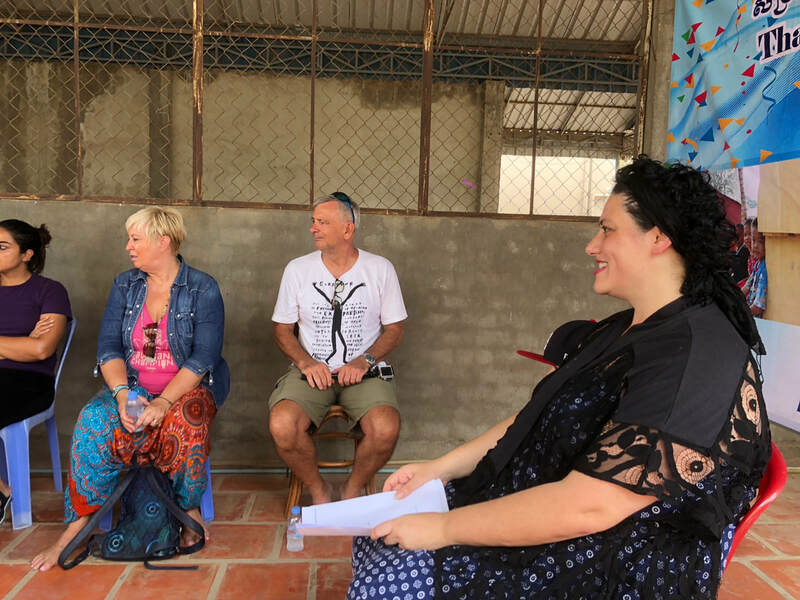 In our group there were John and Nancy from the US, Jackie and Conrad from Tenerife Spain, Pippa from the UK, Simon from the UK, and our housemates Ruchika from India, Rachelle from Australia, and Heidi from Canada. 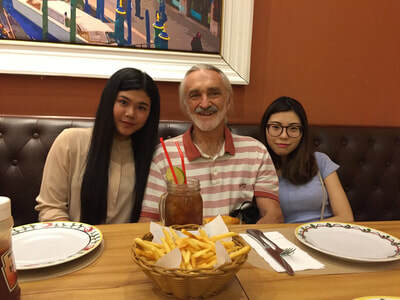 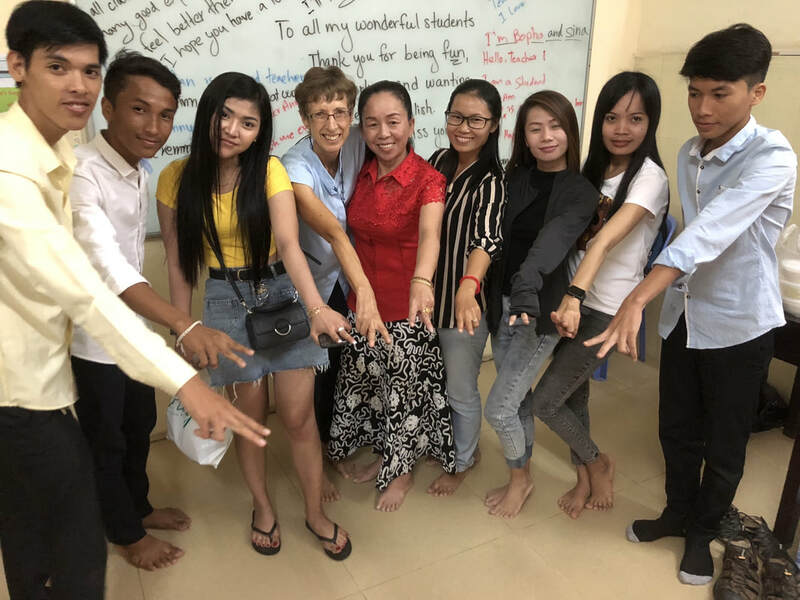 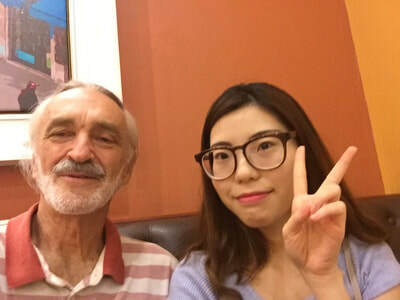 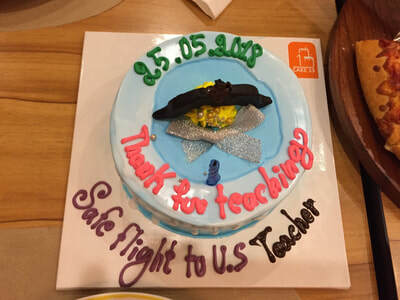 We had different degrees of teaching experience, many had their TEFL (Teachers of English as a Foreign Language) certificate, and ranged in age from 23 to 72. 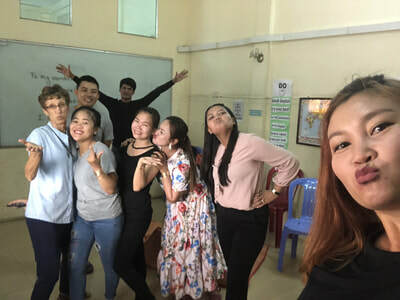 The students at the school are evaluated and placed for one term into one of 8 levels or go into some communications classes or into more advanced classes such as Business English or Public Speaking and Debate. The classes have anywhere from 3 to 20 students and students ages range from 14 to 65 years, with younger children in a Young Learners class. The courses concentrate on speaking with less emphasis on grammar or writing. 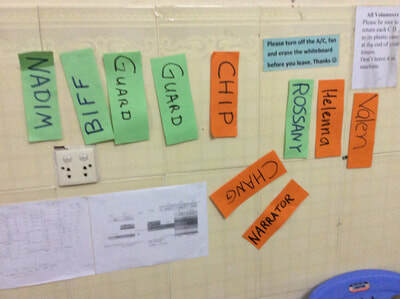 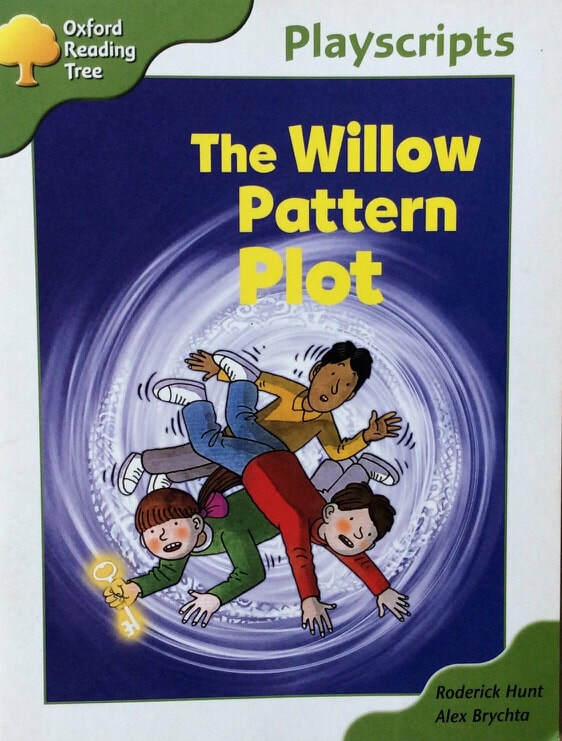 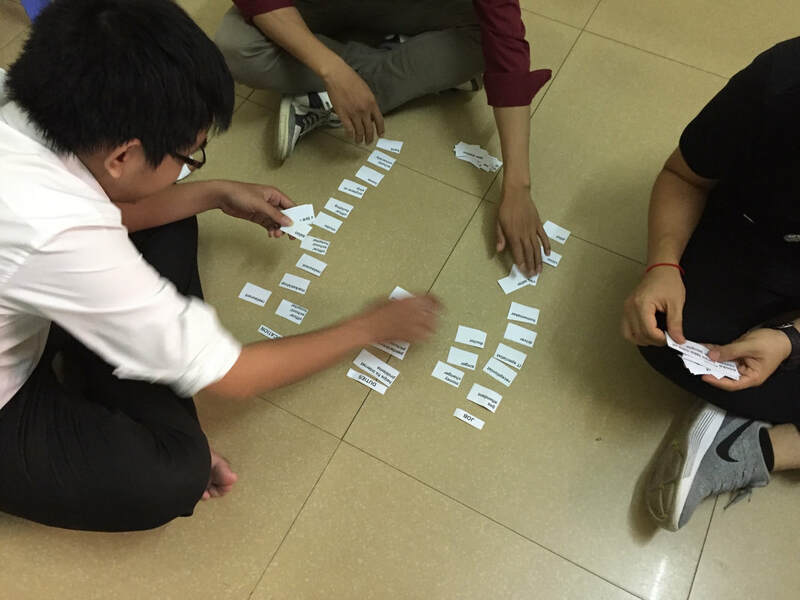 We are encouraged to add lots of interactive activities and games to engage the students. 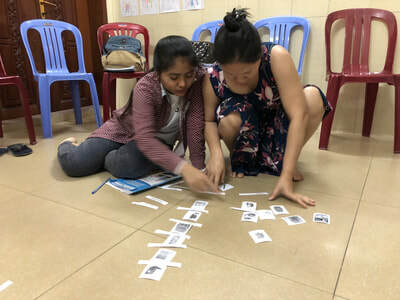 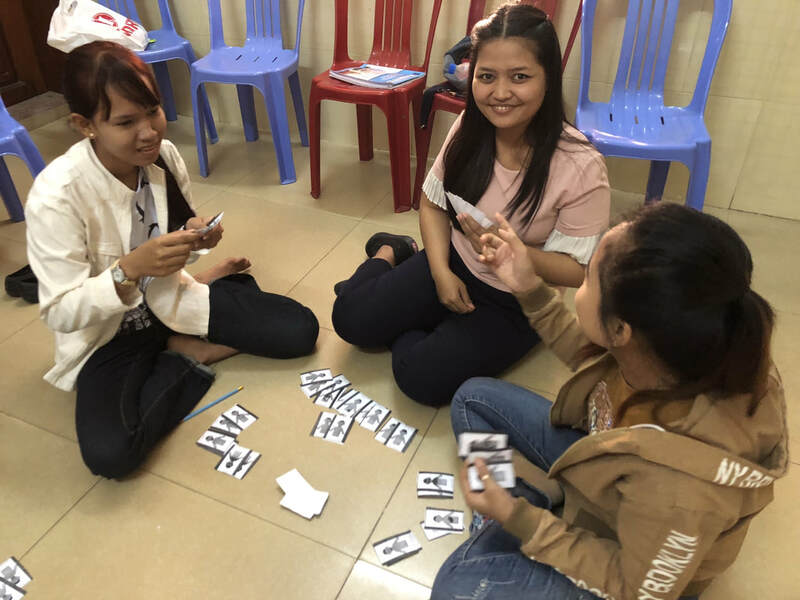 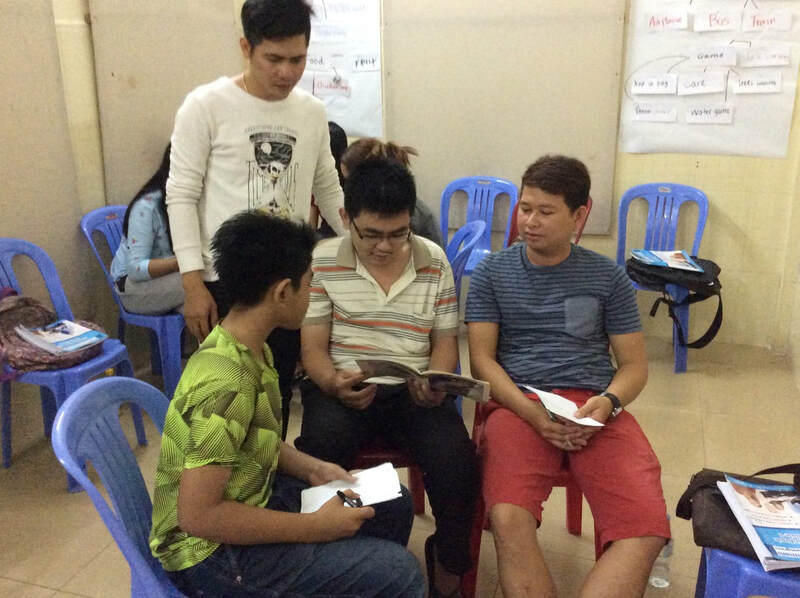 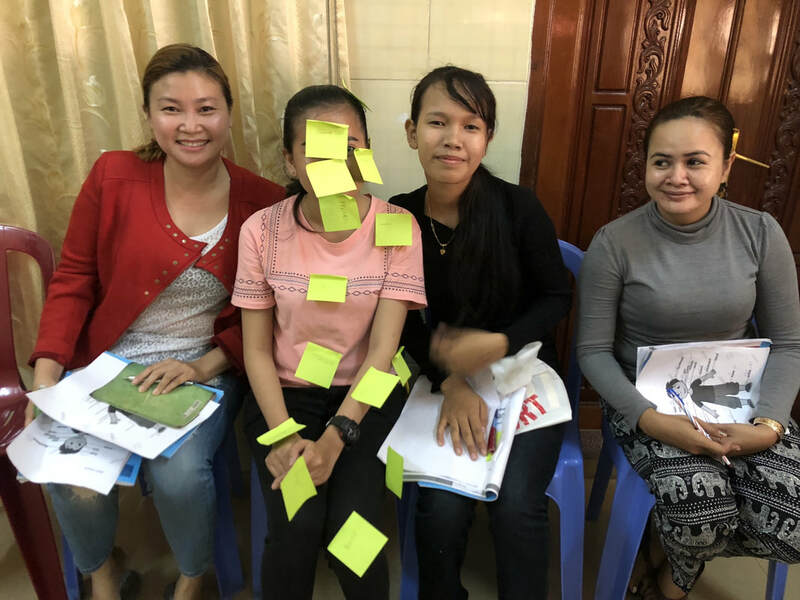 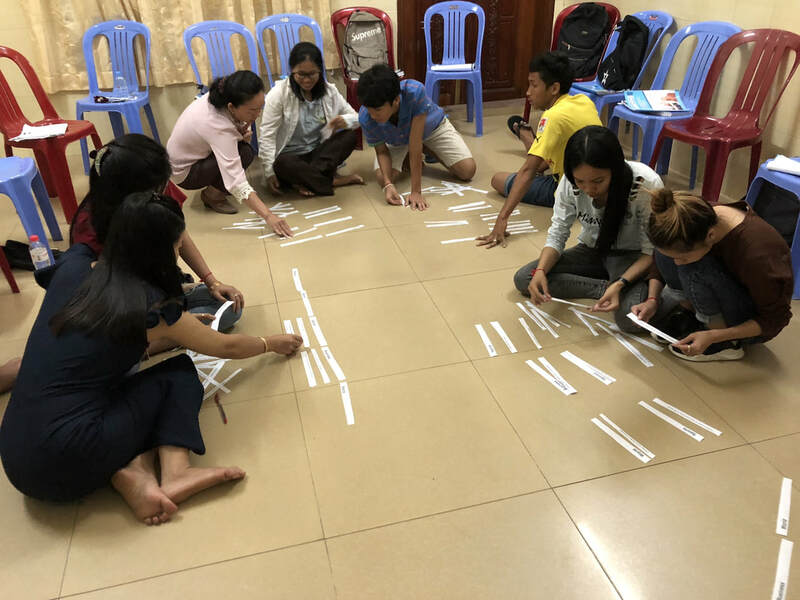 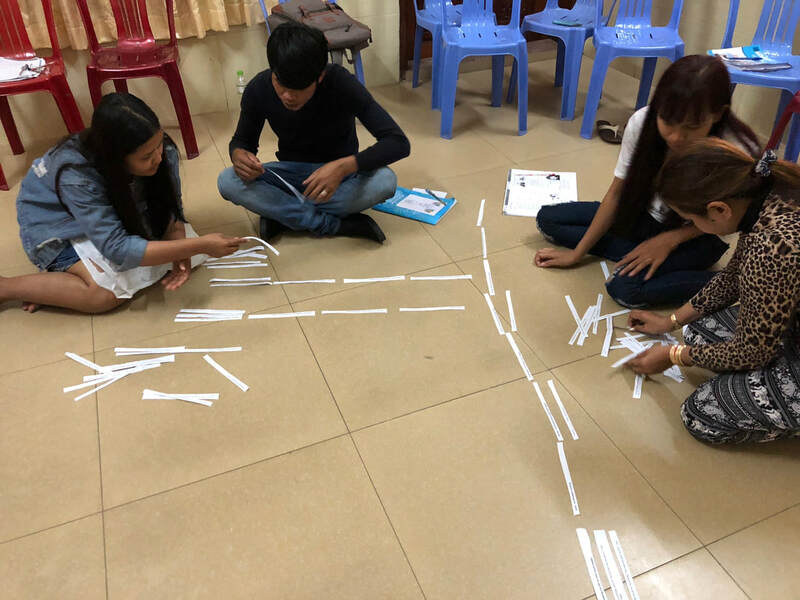 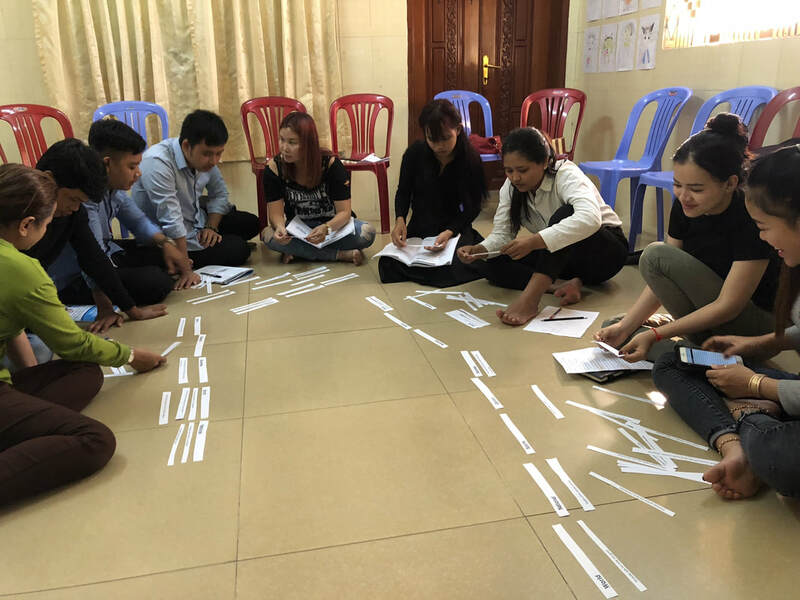 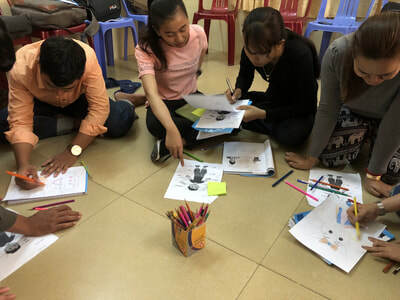 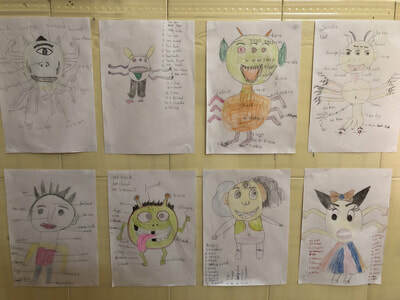 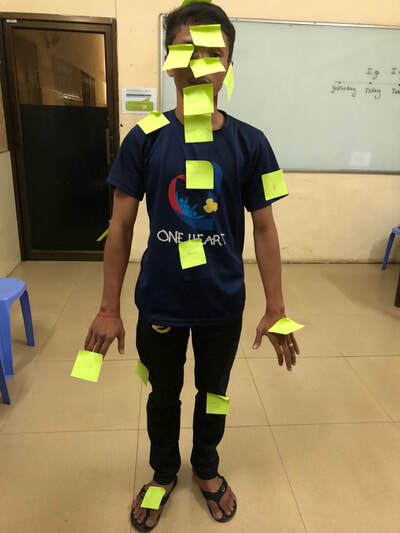 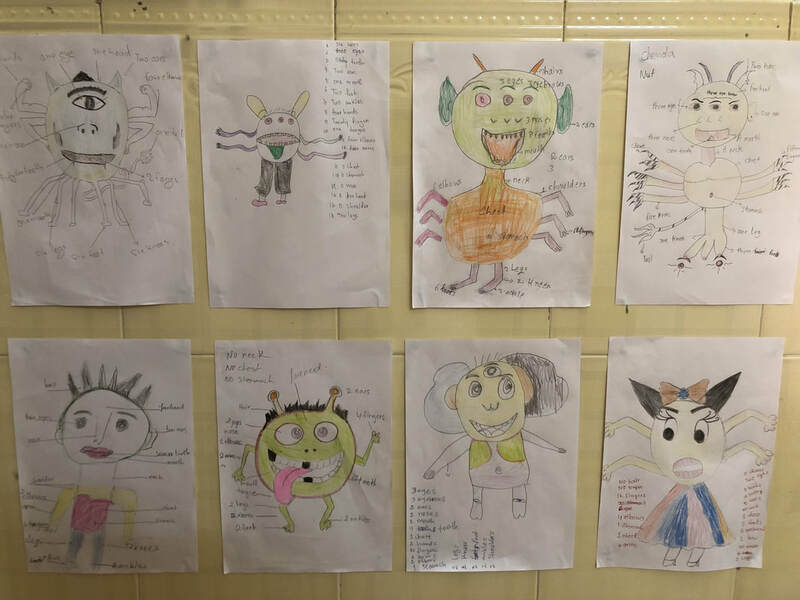 The regular 8 levels have a textbook which is written and annotated specifically for Cambodian students so we get to learn a lot about Cambodian culture through the English lessons. Once students walk through the classroom door NO Khmer is to be spoken, only English - this proves to be an ongoing challege to keep them always using English, but for the most part we succeed. The textbooks are a skeleton, so there need to be lots of supplementary activities - this makes for lots of time lesson planning! 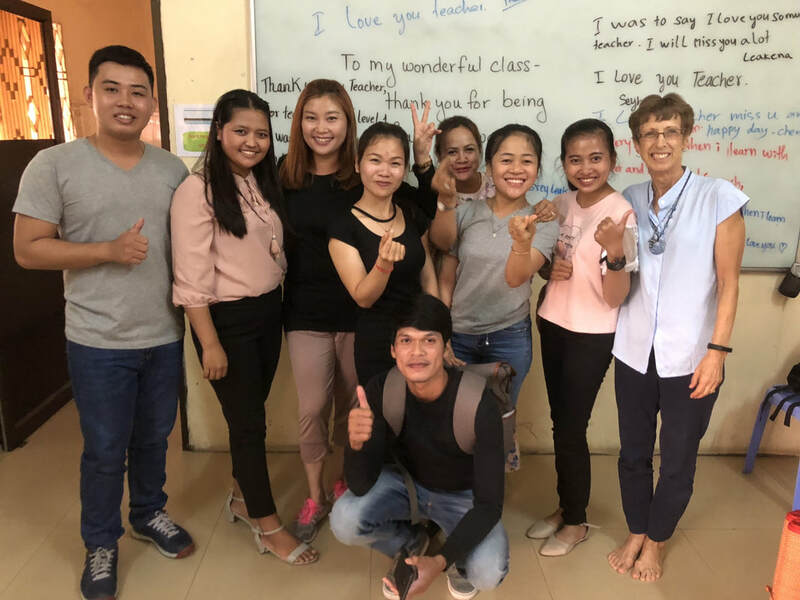 The Academic Manager, Louisa, is a dynamo of energy and enthusiasm, with a rich background in language learning and the benefits of a multi-lingual education. 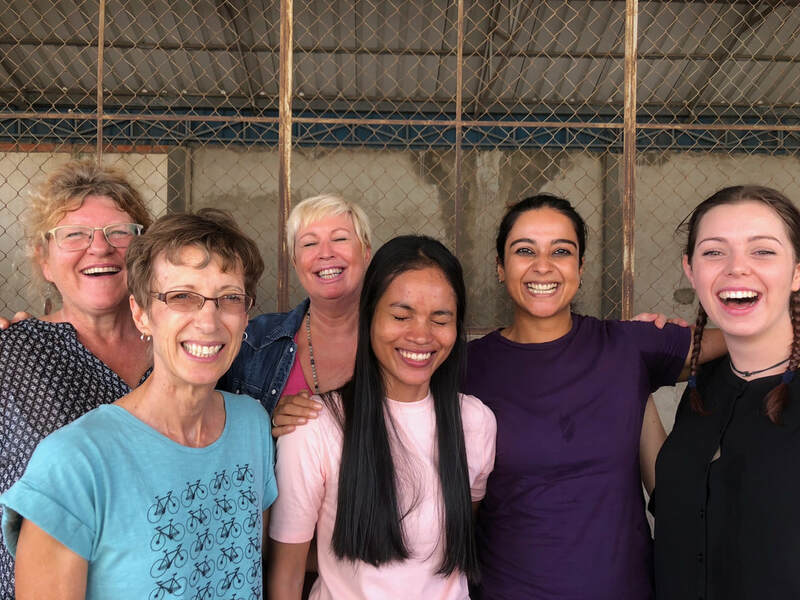 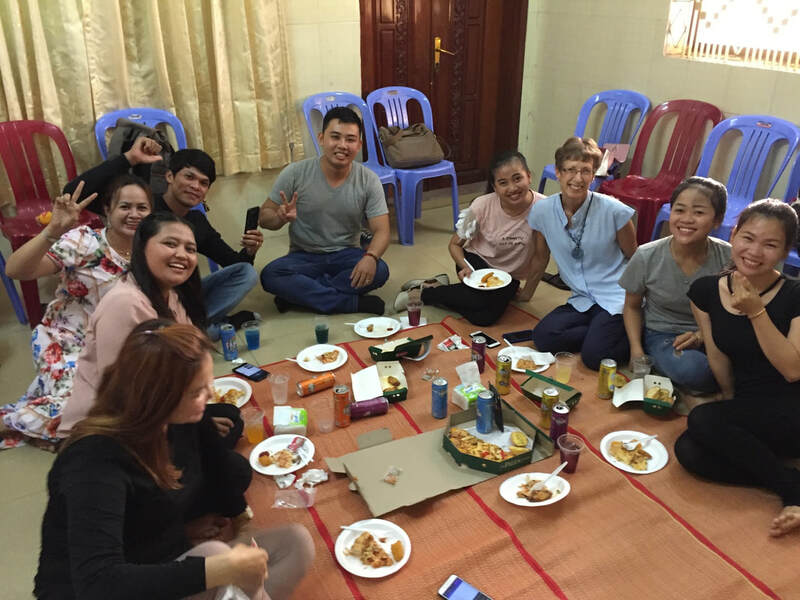 She runs workshops which orient us to teaching, language learning, and Cambodian culture. 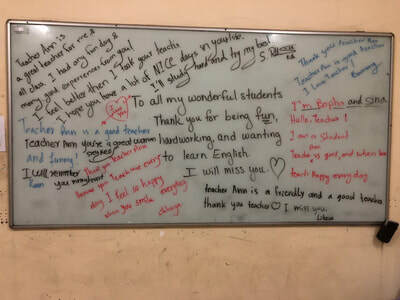 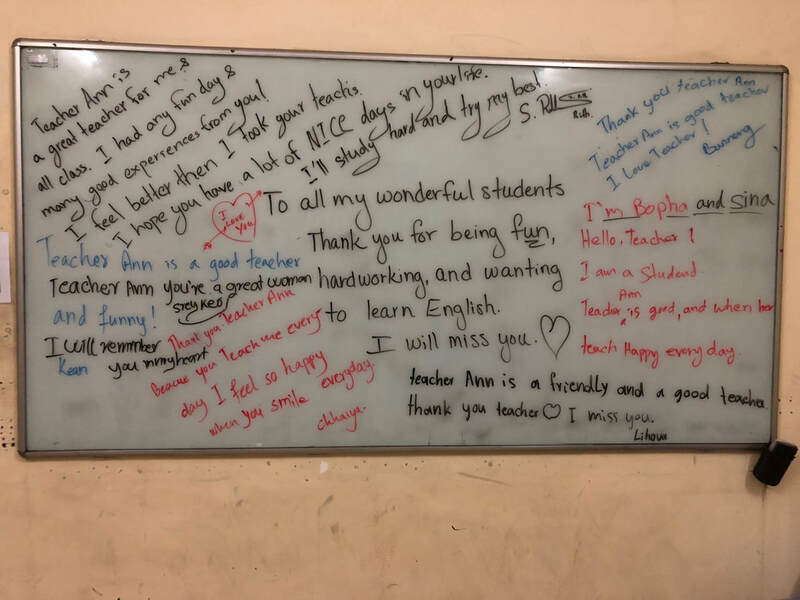 The students are super warm, friendly and very appreciative of our teaching. 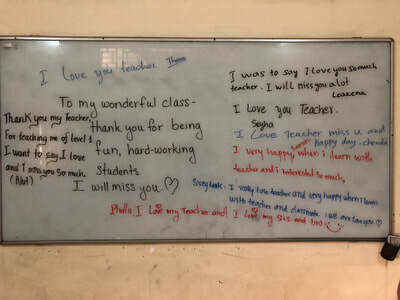 Teachers are respected in this culture and students reflect that in the classroom. 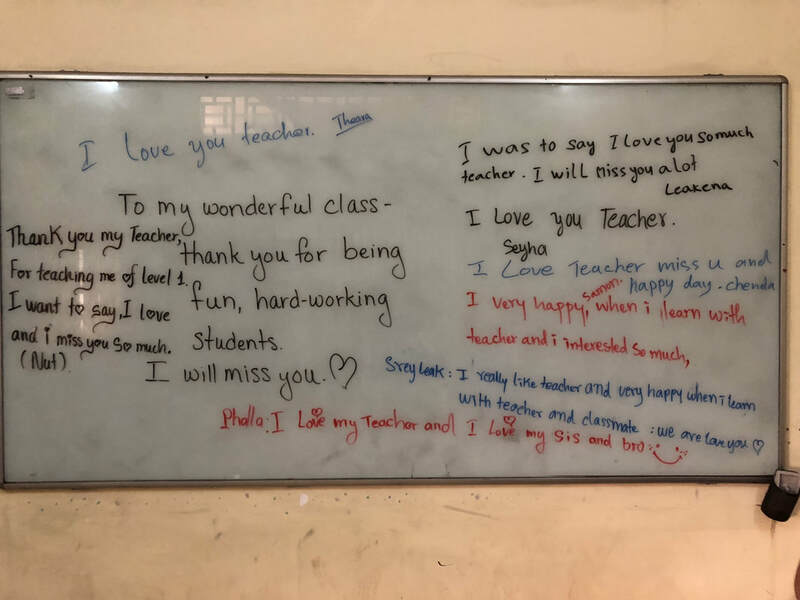 One of the challenges is the sporadic attendance of students - most classes are in the evening and a couple are early in the morning before work/school - but students lead very busy lives juggling long hours of work/school/family along with the English lessons so attendance was irregular for some. 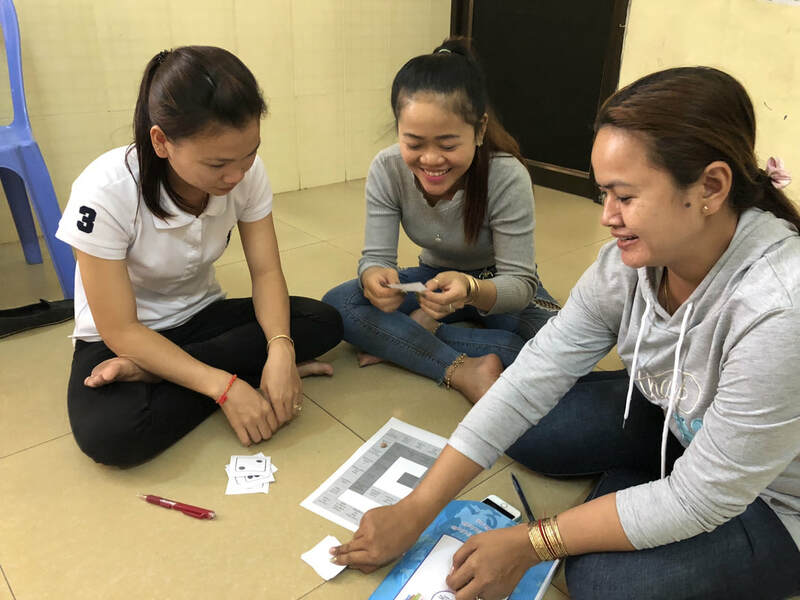 They love to laugh and play games - we spent many happy hours on the floor (very much part of the culture) doing games and activities. 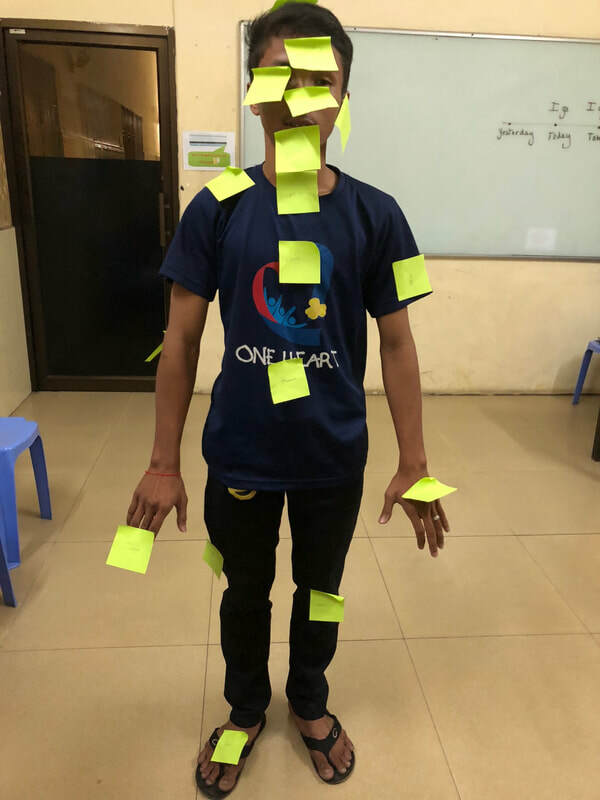 As a teacher you get to be as silly as you want to try and help students understand a word, concept, game or activity. We did a lot of miming to try to teach a word now and then. We all had a lot of fun! 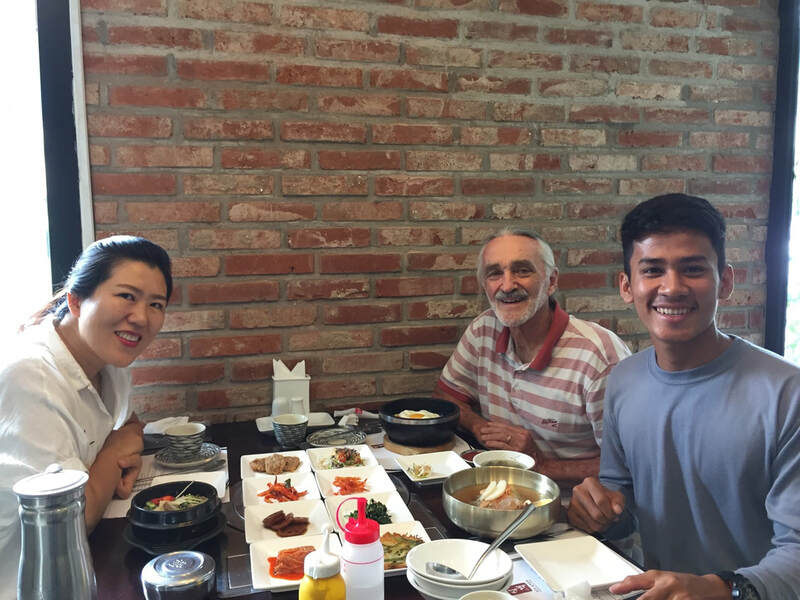 Billy taught Module 6 and Module 8 students (intermediate) while Ann taught Module 0 and Module 1 (Beginners). 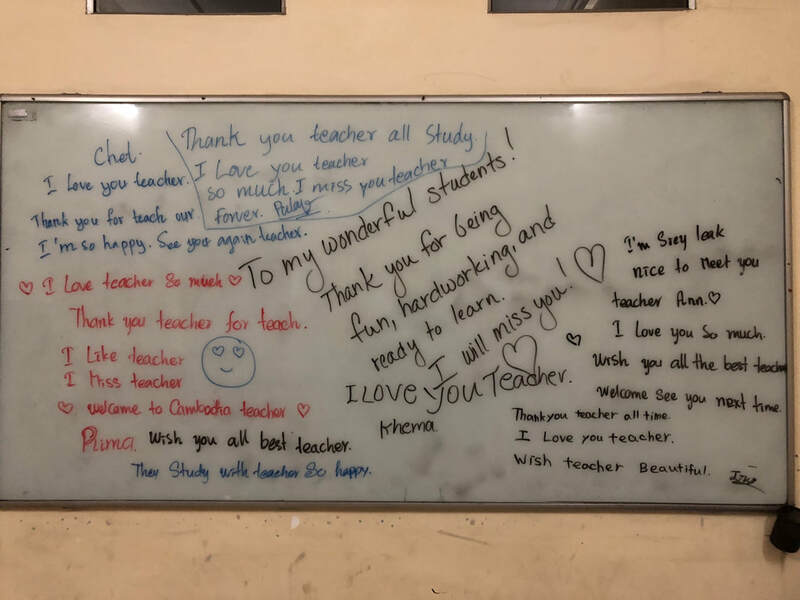 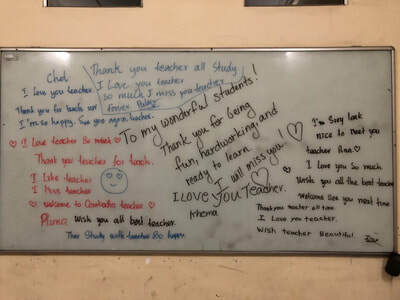 At the end of the term the students throw a party for their teacher and we all eat, talk, sing, dance and feel very honored to be so well regarded by the students. 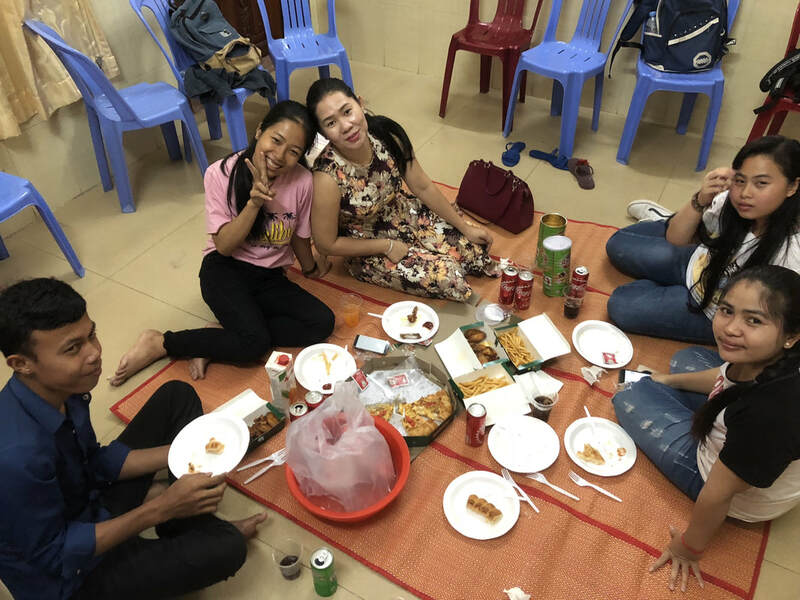 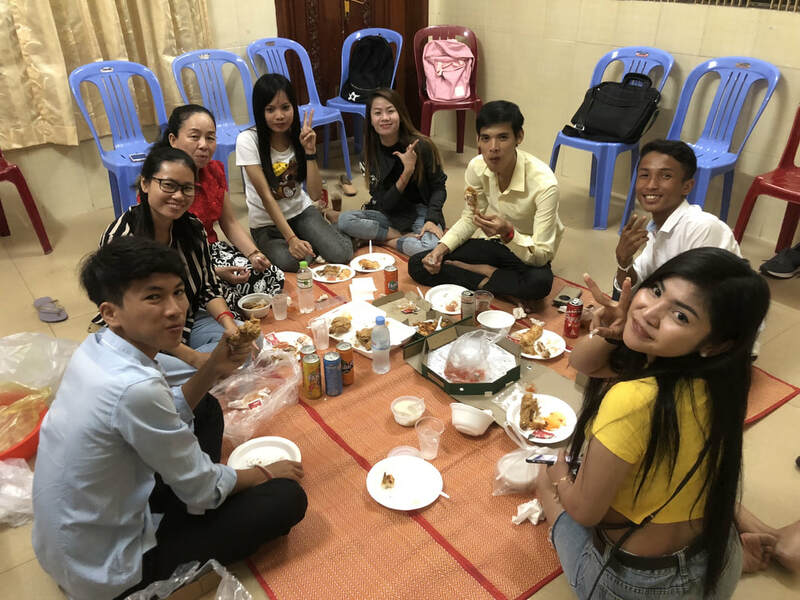 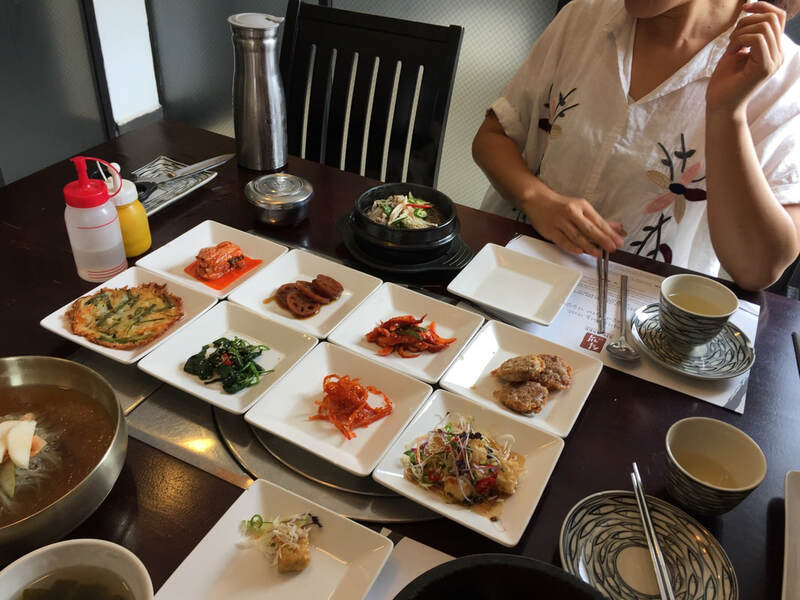 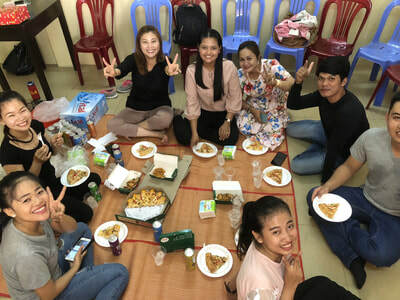 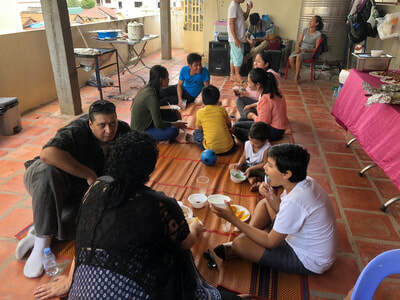 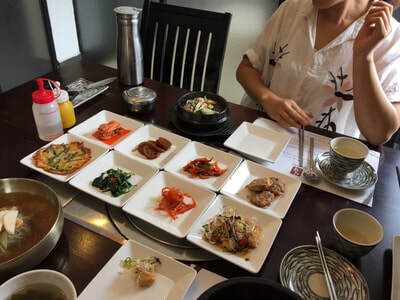 ​At the close of the term, there is a roof-top party at the Volunteer house where we got our certificates, debrief our 3 month experience, and then as always in this culture - Eat!